For Scarborough's Apology To Arnold, Why The Wait? When in my WorldNetDaily piece this week, I talked about cable channel hacks being foolishly signed up for doomed syndicated radio talk shows, I intentionally left names out of it. But if I'd known about the recent behavior of Joe Scarborough on his MSNBC show, you can bet his would've been in there, for sure. There's no substitute for experience, despite syndication hucksters who think they can put anyone on the air, Scarborough is this week's Exhibit "A", having also been given a radio show. Though it happened on his cable program, the incident shows the dangers of inexperienced egomaniacs being given talk shows. Yes, he was a decent congressman from Florida, but that doesn't mean he belongs on the air. He isn't doing conservatives any favors with this sloppy work, either. "You know, this guy has been in so much trouble," he blabbered on his April 25 show. "He's got sagging poll numbers. He's got political groups criticizing his every move. And now the governator is making all his enemies' job easier. "Hey, Governor," Scarborough continued, "way to make 50 percent of California's voting population turn frigid towards you.I don't know how it works in Austria, but let me tell you something, friend,jokes about such matters -- not laughing subjects to women in America." Great point, Joe! Except -- not to throw stones here -- Schwarzenegger never said those things. Scarborough (and apparently the London Daily Mail, not the Evening Standard) got duped. Howard Stern apparently has a Schwarzenegger impersonator on his show regularly, and he was the one rat-a-tat-tatting on about the dreaded PMS. As a result, MSNBC tells us that Scarborough planned to right his wrong on last night's show and that it had taken 10 days to address it because, well, they were unaware of the mistake until we called. However, the Guv's office tells us that they called the show the day after it aired and pointed out the error. Hmm. It took a little longer than CALIFORNIA Gov. 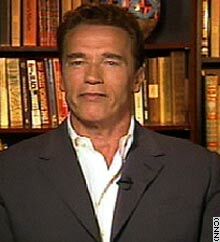 ARNOLD SCHWARZENEGGER's staff wanted, but WESTWOOD ONE and MSNBC host JOE SCARBOROUGH was scheduled to apologize THURSDAY for an APRIL 25 TV rant in which SCARBOROUGH criticized SCHWARZENEGGER for comments actually made by an ARNOLD impersonator on HOWARD STERN's radio show. The fake GOVERNATOR told STERN he wanted to blow up the moon to end women's premenstrual syndrome symptoms, and SCARBOROUGH, according to the WASHINGTON POST, said "Hey, Governor, way to make 50 percent of CALIFORNIA's voting population turn frigid towards you. I don't know how it works in AUSTRIA, but let me tell you something, friend, jokes about such matters -- not laughing subjects to women in AMERICA." Why did it take 10 days and repeated prodding, for Scarborough to apologize for such a mammoth error, on national television? When he blows off the governor's office and waits until the Post gets on his case, you know there's a serious problem. Typically, hosts blame their producers for these types of mistakes, but if you're smart enough to do a talk show, shouldn't you have some kind of ability to wonder whether a story that bizarre is actually true? Even the laziest on-air personality can do a Google search to determine if a rag like the Daily Mail has it right. Wasn't it strange, Joe, that nobody else was talking about this amazing story? Wouldn't every talk show, newspaper, television program and politician have been all over this? We've all made mistakes on the air, but one this big should not have taken so much effort to get corrected. Would Limbaugh ever fall for a "story" like this? How about Savage, Hannity, or major local talk show hosts? I don't think so. Scarborough comes across here like an unprepped fool. 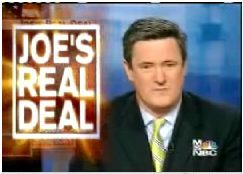 2006 UPDATE: Joe's radio show was cancelled last year. Meanwhile, this has become one of the Radio Equalizer's all time most popular posts! The so called "Governator" makes me appreciate even more the provision that our founders put into the constitution saying that foreign born people can't become President. Why is the main stream press not pointing this mistake out more! Scarborough should be hung from the nearest MSNBC transmitting tower, the guy is a disgrace to journalists everywhere. Screw him and his whole staff, they're morons. A lot of people seem to be going to this page today- does anyone know why? Is this back in the news today? On Friday, May 13, Scarborough's blog show that the man still has tremendous balls on him. He rants about the pessimistic NY Times reporting on the Iraq War, nevermind the hypocrisy that he can't report his way out of a paper bag! A Return To "Bad Old Days"
How Much More Time Do They Need?